The rust patched bumble bee. 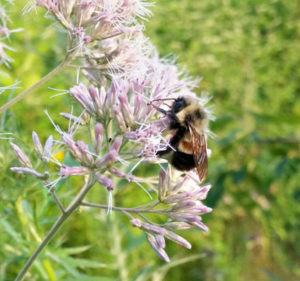 The rusty patched bumble bee was designated last year as “endangered” and teams are fanning out in Iowa to search out the insect and determine its status here. Once identified, the bees are released. “We also look for specific plants in the field that are flowering,” Moore says. “Wild bergamot or bee balm, that one of their favorite ones that they have during the year.” Bees also gravitate toward coneflowers and Joe Pye weed. Iowans can help the struggling bee populations by planting those varieties in their yards — and by minimizing the use of pesticides. The bees have been confirmed in counties across mostly eastern and central Iowa. They are: Allamakee, Black Hawk, Boone, Clayton, Jackson, Johnson and Winneshiek. Learn more at www.bumblebeewatch.org.